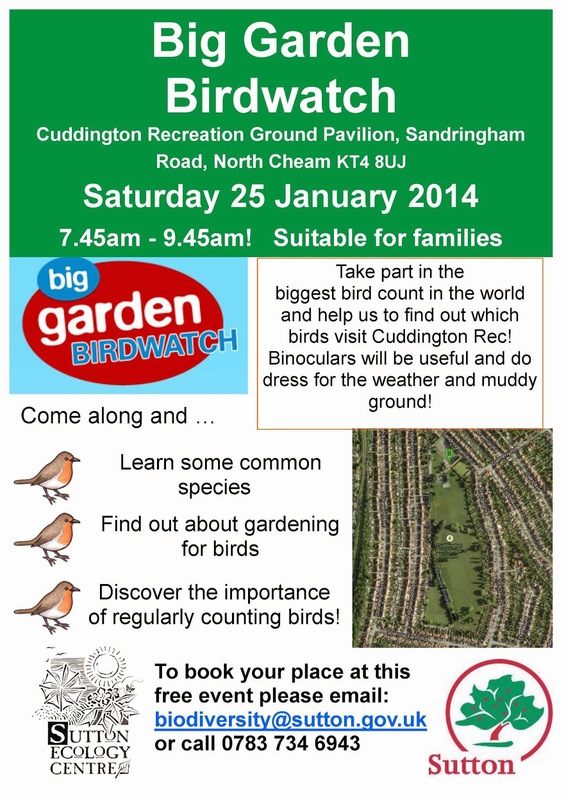 For two hours next Saturday (25th January) morning (reasonably early) Worcester Park's ornithological contingent will be down at Cuddington Rec taking part in what is apparently the biggest bird count in the world. The Big Garden Birdwatch, which is run by the The Royal Society for the Protection of Birds (RSPB) is encouraging people to take part in this event to help keep an eye on the levels of the wildlife in our local area and the country as a whole. "Bird populations are a great indicator of the health of the countryside. That's why it's so important to take part in surveys like the Big Garden Birdwatch to keep an eye on the ups and downs of the wildlife where we live." The Big Garden Birdwatch has been going since 1979 and last year 590,000 people took part and counted 8.2 million birds! To take part you just need to register and then spend an hour over next weekend counting birds in your own garden or a nearby green space and then submit the results. The Sutton Ecology Centre, which is part of Sutton Council's Biodiversity Team has arranged a 'bird count' in Cuddington Rec from 7:45am until 9:45am (as per this poster - which oddly calls Sandringham Road 'North Cheam' but I'm sure it's Worcester Park) so if you would like to join some other people counting the local wildlife why not email them as suggested on biodiversity@sutton.gov.uk or telephone them on 0783 734 6943.